If Governor Rauner’s proposed budget is passed for fiscal year 2016, DCFS services for young people aged 19-21 will be eliminated. This critical point in young people’s life is difficult for everyone, but it is especially fraught for kids who have experience abuse, trauma, mental illness, and neglect in their formative years. Thresholds’ Dr. Marc Fagan has written about the impact these cuts will have immediately, and how just how devastating they’ll be. Thresholds helps this vulnerable population move from child services to adult services as smoothly as possible. We try to set them up for success. We help stories like Nikkos’ happen every day – but these stories won’t be possible without the critical funding that Governor Rauner proposes for elimination. Nikkos is 26 years old and a member of EMERGE – Thresholds’ program for young adults transitioning from youth mental health and social services into programs that help adults live independently. A native of Virginia, Nikkos struggled with mental illness as a teenager and was even homeless for two years from the age of 17 to 19. His grandmother sent him a bus ticket to Chicago about seven years ago so he could come live with her and get off the streets. But a few months after Nikkos arrived in Chicago, his mental health challenges became apparent. He was engaging in harmful and destructive behaviors that were getting worse and worse, so his grandmother sought help for him. Nikkos was admitted to a psychiatric hospital and then discharged to a nursing home where he received a diagnosis of bipolar disorder, Post Traumatic Stress Disorder (PTSD), and severe depression. Nikkos worked hard to become independent and, after a year and a half, he was able to be discharged from the nursing home and eventually relocated to a group home. That’s where other residents told him about Thresholds. Right away, Nikkos could tell that Thresholds was there for him. They listened to all of his problems to find solutions, and they understood that his mental illnesses and physical well-being were interconnected. The therapists found him to a nurse practitioner to help treat back problems that had been hurting him. They helped him find his way out of the group home and into a single room occupancy building in downtown Chicago. It’s not where Nikkos wants to be permanently, but for now, he says it’s extremely convenient, near the CTA and bus stops. Nikkos is now working with an education specialist at Thresholds, and has enrolled in GED classes at Truman College. 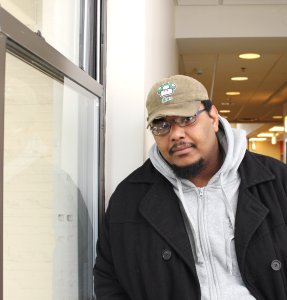 His scores on placement exams were high enough that he qualifies for college assistance. Nikkos’ immediate goals are to complete his GED by this summer and then start college. He is especially interested in acting, filmmaking and writing. And perhaps the most important thing that he’s gained since he’s started working with Thresholds and the EMERGE program is confidence. He sees his future in a whole different light. If budget cuts proposed by Governor Rauner become law, when hundreds of young people like Nikkos turn eighteen they will “age out” of the guardianship of the State of Illinois – and providers like Thresholds won’t be there to provide a lifeline. Nikkos belongs in a college classroom, earning his degree and making art that will enrich this entire city. Without services, Nikkos and other promising, motivated young people like him face uncertain futures, including nursing homes, homelessness and jail. Make your voice heard – it only takes two minutes. Tell your legislators and the governor that we can’t cut ourselves out of the budget crisis, we need a revenue solution. This entry was posted in News and tagged advocacy, budget, chicago, DCFS, Employment, Illinois, mental health, mental illness, public policy. Bookmark the permalink.